Xolo launched its new Smartphone phone XOLO Play 8X-1200 in Indian market. 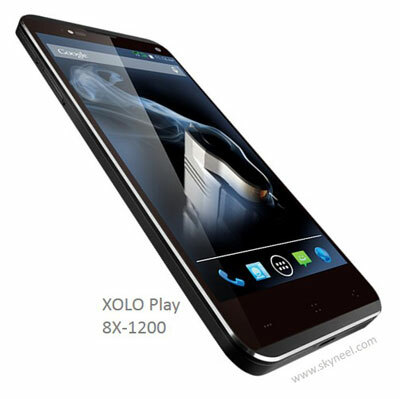 XOLO Play 8X-1200 has lots of RAM 2GB and lots of storage capacity 32GB inbuilt. Xolo launches its new Play 8X-1200 with Octa-core 2GHz processor. XOLO Play 8X-1200 has touch Displays offer a more interactive experience and it has sharp and clean screen with ~ 441 ppi pixel density. Play 8X-1200 has faster CPU means more smooth experience.it has a high resolution camera for taking sharp and clean photos. XOLO Play 8X-1200 is a Smartphone phone which is available in dual SIM with a 3G facility in different Color Variations as like Black, and red. This phone uses chipset for 3G versions with 2 GHz Octa core Mediatek MT6592T processors. It has 13 MP (4128 x 3096) with Daul LED flash, auto focus facility on rear and 5 MP front camera. Play 8X-1200 Powered by Octa-core 2.0 GHz processor With GPU Mali-450MP4. Play 8X-1200 has Mediatek MT6592T Chipset. Play 8X-1200 has 2GB RAM With 32GB ROM and user can’t expand Memory. Play 8X-1200 has 5 inches Screen. It has IPS LCD capacitive touchscreen Display with 1080 x 1920 pixels Resolution. It’s screen can display 16 million colors. Play 8X-1200 has 13 MP Rear Camera with 4128 x 3609 pixels and 5MP front camera. Play 8X-1200 is a stylish phone, it has 143 x 68.5 x 9.7 mm Dimension. Play 8X-1200 runs on 4.4.2 Android KitKat . It supports Java and browser flash. The Smartphone has a compass, Accelerometer, proximity and Maps, Calendar, Google Search, Gmail, YouTube, Google Talk, Alarm, Calculator, Clock, and other Google sync apps. This is power pack with loaded lots of features and apps. Play 8X-1200 has supported 3G and 2G (GSM) networks.It has Wi-Fi, Bluetooth, GPRS and EGPRS or EDGE, and Li-Ion 2300 mAh battery. 1. Play 8X has lots of RAM 2GB. 2.Play 8X has Latest Android OS, v4.4.2 (KitKat). 3. Play 8X has High Speed Octa-core 2.0 GHz processor. 4. Play 8X has High Screen Resolution with Full HD. 5. It has lots of Storage Capacity 32GB. 6. It has High resolution Rear and Front camera. 1. No memory Card Support. 2. TV out is not available in this phone.